The beauty about vegetable stock is that there's no one "right" way to make it. You typically just toss whatever veggies and herbs you have in their, add some water, and let boil and simmer for hours on end. Homemade vegetable stock is that one pantry staple that I encourage everyone to have in their homes for so many reasons. Firstly, it's simple to make. Sure it takes hours on the stovetop of boiling, and then about 5-10 minutes of straining, but if you're around the house anyway, and you're using a pressure cooker, it's almost no bother whatsoever. Secondly, it's healthier than that store-bought stuff. Of course, I've found myself in need of stock and nothing in the house, but once you start to make your own broth, you'll realize how salty the stuff you get in that waxed cardboard box is. I mean, even the "low-sodium" versions will raise your blood pressure. Thirdly, homemade vegetable stock is super versatile, which is why I like to always have it on hand. You can sip it straight up when you're sick; you can use it instead of water to boil and flavor grains or beans; and you can make a number of soups and stews with it. Best yet, it's easy to keep. 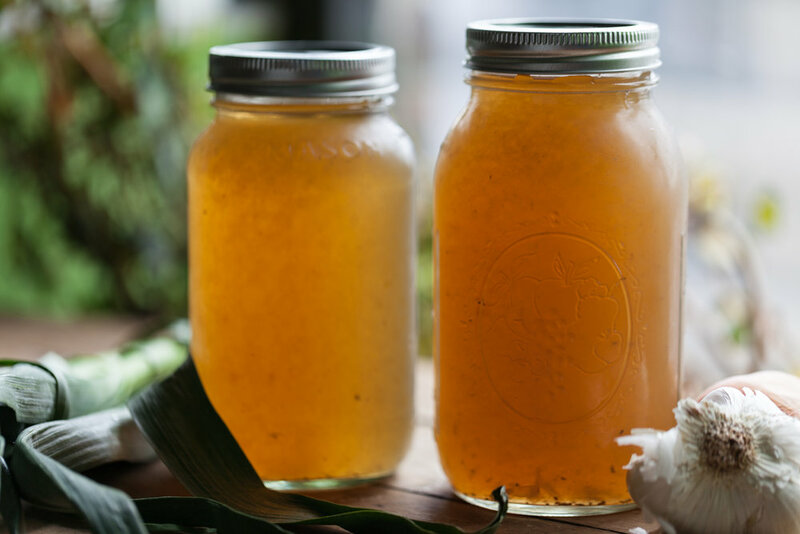 If I know I'm going to use the broth in the next few days, I just store it in a pot or in Mason jars in the fridge, but if I don't know when I'm going to use it, I'll put 4 cups of the gold liquid in medium ziplock bags or in Mason jars. (I'll give you some storage tips later in the article). * Part of a post in conjunction with my sister site, www.sugardetox.me and my newly released book! Making broth is the base of so many recipes within my newly released book, SUGARDETOXME: 100+ Recipes to Curb Cravings and Take Back Your Health. Add everything to a large pressure cooker (or heavy-bottom soup pot) and bring to pressure of high heat. When it reaches pressure, release some of the steam and lower so that the pot maintains pressure and continues to simmer. The more you let this simmer, the more nutritious and flavorful the broth will be. I typically let it simmer for around 2-3 hours, depending on what I have time for. After the time is done, turn off the heat and let the pressure cooker drop. Release the top and let cool with top off for about 15 minutes. Strain the soup with a fine mesh strainer into another soup pot. Funnel or ladle the golden mixture, if you'd like, into Mason jars or ziplock bags to be stored or frozen. Vegetable stock should be a beautiful golden hue. I've also found that if I add more mushrooms, it'll be a deeper, browner color. The broth is really flavored by what you put in it. And don't shy away from the skins of vegetables! Those actually are some of the most nutritious parts that we typically don't eat, so one way for us to unlock that nutrition is by keeping those skins on and making broth with them! Typically after you strain the broth, you'll have a steamy, mushy pile of vegetables and herbs. I typically double bag a paper bag and scoop the veggies in there and freeze in my freezer until I can take it to the farmers market for composting. Freezing your soup stock will be good for at least half a year, if not more, though it's never been in my freezer for that long. If you're storing in Mason jars (or any jar for that matter) in the freezer, keep in mind that liquids will expand as they turn to ice, so you want to be mindful not to crack the containers. Fill to about 3/4 of the way full without the top on. Once it freezes, you can add the top on the container. To unthaw, I generally sit my ziplock bag or jar in some hot water in a bowl, just enough for the ice rock to slide out of its home and into a pot that I'm cooking in. Also note that I didn't add salt to my stock. I typically never add salt until I know what dish I'm making. This lets you control the amount of salt you want to use, if any at all!